The Farmer’s Dog treats no two dogs the same. All user touchpoints, from their first experience on the website, to their email on-boarding, and all the way through to the product and packaging itself, are completely personalized and unique. Is this the future of all CPGs, an object lesson in where digital tools and direct marketing techniques ultimately lead us? When his dog Jada had stomach problems, he tried every single premium dog food on the market and finally was advised to cook food for her. He took the bag of food he had been feeding her and cooked the exact same ingredients. “It was like magic. All of her symptoms disappeared overnight.” Brett found that control of the ingredients was the key, and he realized the power that food has on our health. So, he went looking for a company that could deliver healthy food for his dog, a company that was trustworthy and transparent. He found the company he was looking for simply did not exist. The Farmer’s Dog was born. The company’s goal is to make the healthiest dog food in the world but also to make it very convenient for its customers. Freshly cooked dog food is customized for each dog’s specific need and delivered by subscription. This kind of personalization system addresses the consumer’s confusion caused by rows upon rows of dog food on store shelves with colorful packaging and buzzwords like “all natural” and “organic,” and even by advice obtained by Google searches. But it also gives the marketer data that is personalized by customers’ filling out questionnaires on the website. The Farmer’s Dog knows a great deal about each individual dog and can capitalize on that knowledge by suggesting subscriptions and, even further, it can use relevant messaging even to those who haven’t subscribed. Personalization is convenience over novelty, Brett says. Marketers should ask themselves if they are personalizing to make their company grow or are they personalizing for their customer. If it’s only for marketing purposes, “I would avoid it as it’s difficult to scale, especially if it’s a product like ours.” (Maybe purely digital is a different story.) For The Farmer’s Dog, it is very difficult to scale as each subscription is completely unique. When they started personalization, it was done on a spreadsheet by Brett. “Every time I had to touch it, it was like an anxiety attack.” They had a technologist build the system and found that the toughest part in terms of scalability isn’t on the tech side, it’s on the fulfillment side because predictability is important with fresh food. On the fulfillment side, each box is completely unique. They built a process to allow that to happen at scale with all the quality checks. Personalization is important because of two things. 1. Identification: You might have multiple dogs in your household so that’s why their names are on the packs. 2. Accurate portions: They are packaged according to exactly how many calories one’s dog needs per day. “Smart subscriptions” ensure that food is being delivered based on the customer’s need not the marketer’s need to sell. Through customer feedback, the company learned that some customers wanted to get more food to fill the extra freezer in their house on a monthly basis. Others in New York City might have two dogs and a tiny freezer, and need to get deliveries every week. Personalization flexibility is all for our customer and their convenience. On the marketing side, there are benefits to personalization. 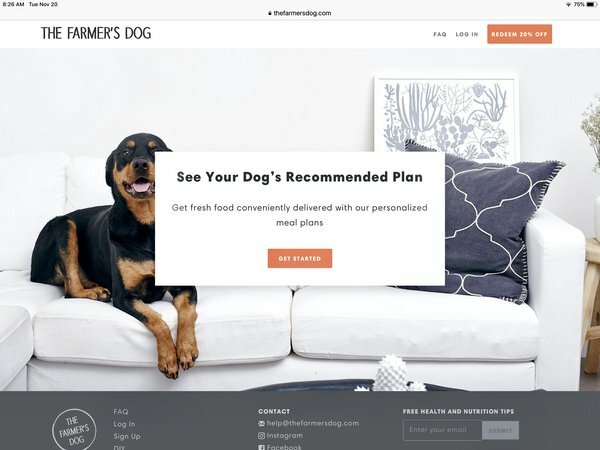 If a customer doesn’t sign up right away after they come to the website, The Farmers Dog can send personalized information by email to share a testimonial about a dog that is just like their own. There is no marketing team, per se, just community because everything they do is about creating better relationships with their customers so they can get better and have really long-term retention. Customers feel like they are part of something special and The Farmer’s Dog communicates with them on all forms of social media. Most growth is organic because the community feels part of the company. There is also the cuteness factor. When customers open the box and see that there’s food that has amazing quality and that it has their dog’s name on it, there’s a certain comfort level. People have a sense of pride in giving their dog its best lifestyle. People want to talk about it. Anytime they find one of their customer’s dogs has passed away, that is a churned customer, they are gone forever, so they actually send flowers, which is not cheap. But they might come back if they get another dog, they might tell The Farmer’s Dog’s story. It’s about this relationship that they built, they know what their customers are going through. Customer obsession is the future for brands, it’s not about marketing. Just focus on the customer and the rest will unfold for the marketer. Personalization is convenience over novelty. Don’t do it for novelty or marketing purposes. Continuous learning involves having internal skepticism. Marketers may think they know what they’re doing but they might be wrong so stay open to listening and improving. Find touchpoints that really matter and do them effectively.